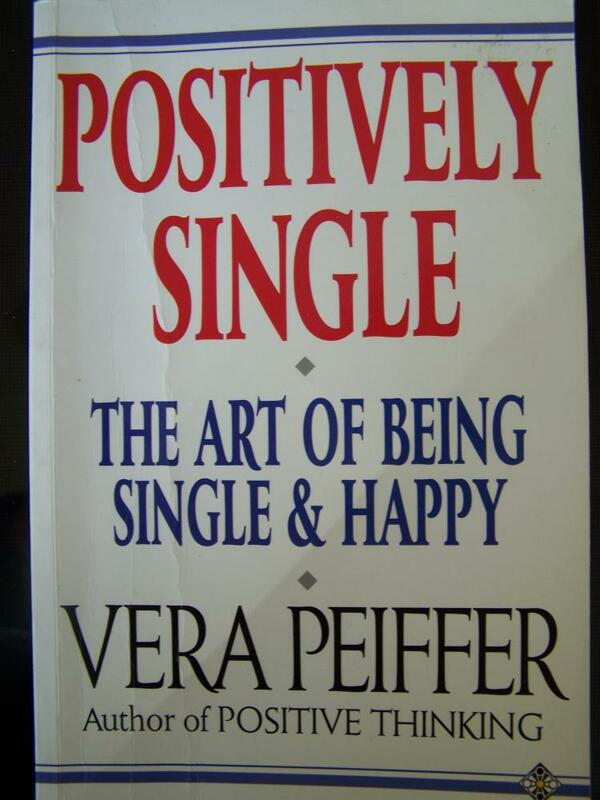 Vera Peiffer writes with excellence and insight about the single life in this book published in 1991. The book is a treasure trove of insights, wisdom and intelligent approaches to being single. I am a happily-married and one-and-only-time married guy, but over the years I have come to counsel, in a non-professional way, singles who have never married, singles who were married and are now single and, of course, some married folks who wish they were single -- such is the nature of human existence. So, when I came across this book in a book store, I read a few pages and decided that this book would help me in counseling others or recommending the reading of the book should the occasion arise in the future. I review aspects of this book here, should you decide to consider it as a possible useful handbook or guide. Everyone was single at one time in life, so we all share singleness. However, not everyone gets married and not everyone who gets married stays married, so this book cuts across many places as it delves deeply into being “Positively Single” and happy. The “happy” single part is the elusive part for many people and Vera Peiffer quickly deals with happiness early in her writing. “Positively Single” takes the issues head on in seven well-balanced chapters and 148 pages. The reader can be prepared for succinctness and clarity throughout the book: 1. “To Be or Not to Be”; 2. “Why Are You Single?”; 3. “Social Stigma or New Trend?”; 4. “The Pitfalls Of Being Single…” 5. “…The Types Who Fall Into Them”; 6. “…And How To Avoid Them”; 7. “Happy Singles And How They Do It”. “To Be or Not To Be” of Chapter 1 has an early and important message in this three-page Chapter (Yes, three total pages). Here’s Vera Peiffer’s first really strong message and reminder: “No matter whether we are in relationship or not we still have to work at achieving happiness. It is foolhardy to rely on another person to provide a meaning for our life, because this person may not be with us forever. Self development is therefore extremely important…”. That really makes sense, doesn’t it? In “Why Are You Single?” of Chapter 2 there are only eleven pages and here the author compares and contrasts young singles, divorced singles, the widowed people and those single by choice. These are illuminating and quality discussions of states of being and states of mind of singles. Chapter 3 is entitled “Social Stigma or New Trend?” Here the author clearly shows how women in modern times have become more financially independent and self-sufficient. Based on that financial independence, men no longer need fear being seen or decreed as the sole bread-winners. However, despite female and women’s liberation and new modern directions in their individual lives Vera Peiffer believes that all persons, whether single or not, should be focused on “finding out what our own perspective is. We cannot change others, we can only change ourselves.” This seems to be a fundamental idea and theme that runs throughout the chapters and makes the book a real and complete examination of self from motives to actual personhood and character. These are meaty chapters of the book. In Chapter 4 the author confronts loneliness, boredom, decision-making, social life, finances and holiday issues and Chapter 5 defines specific types of singles: the recluse, the party-goer, the career person, the beginner soloist, the would-be single, the fanatic soloist and the desperate single. She examines how these person’s feelings and behaviors based on their inward feelings and societal and outside viewpoints. This inward and outward view serves the author’s purposes of placing in context objective as well as subjective values for each of the types. This comparative analysis is done smoothly and intelligently in this reviewer’s opinion. Chapter 6 is the avoidance chapter and it is the largest of all the chapters. Chapter 6 is a warning to all singles. It is a loud caution not to become one of these types, because one of these stereotypes can become your own, if you are not careful. These are the problems and worries that force singles into habit-forming niches or corners and which make extraction from them difficult. Here Vera Peiffer shows everyone how to: cope with changes, keep a diary, talk about change, practice at getting better, develop a positive self-image, set goals, shift perspectives and develop new skills. But this chapter goes even further as it encourages: more and better listening, emphasis on quality of people and relationships (not the quantity or numbers of these), comfortableness with self and friends as important, making and keeping quality friends, selectivity, being unique and relaxed and comfortable within your own home and skin. Finally, she encourages the expansion of personal interests and vistas and the development of a bright and positive outlook. In the final Chapter 7 the author interviews three singles (two females and one male) who have succeeded as singles in one way or another. She interviews each single and has them explain their singlehood walks and show how this has worked for them. If these singles have figured their single lives out (as also the author has) and everyone seems fine with that, she predicts you can also. “Positively Single” is a very good, informative book. The author points singles toward higher ground and she shows and tells how singles’ lives can be a better experience for all who need to find their way upwards. Her insights in this book will promote singles’ interests and help assist many singles to more pleasant, resourceful and productive life ventures. What more could one ask from a book like this?